The Congress of Industrial Organizations (CIO) Political Action Committee was established in 1943 to educate and mobilize CIO members about political issues of special concern to labor. Labor organizations have contributed significantly to the history of American social welfare. The entries below describe various elements of the history of American labor, including the Knights of Labor, Mother Jones, and the labor priest Monsignor George Higgins. AFL-CIOThe AFL–CIO is a federation of international labor unions. Since its inception as the American Federation of Labor, the AFL–CIO has supported an image of the federation as the "House of Labor"—an all-inclusive, national federation of "all" labor unions. AFL-CIO & Community ServiceThe extent of trade union activity in community affairs is developed and explained during the course of this lecture. American Labor Party: 1936The American Labor Party of New York State enters the campaign of 1936 with a three-fold purpose, discussed in this article. Anderson, MaryMary Anderson (1872-1964): Advocate for Working Women, Labor Organizer and First Director of the Women’s Bureau in the U.S. Department of Labor. Auto Workers Strike (1933)Article by Walter Reuther, one of the most prominent labor movement figures of the 20th century, in The Student Outlook, March, 1933. "The challenge to organize the production workers was taken up by the Auto Workers Union, which is organized on a broad industrial basis and is founded on the principle of the class struggle." Chávez, César Estrada (1927-1993)César Chávez was a folk hero and symbol of hope to millions of Americans. In 1962, he and a few others set out to organize a union of farm workers. An ardent advocate of nonviolence, Chávez was one of the most inspirational labor leaders of the 20th century, with an influence that stretched far beyond the California fields. Company Unions and the American Federation of Labor (AFL)Article by Louis Adamic, The Nation, 1934. "In brief, the A. F. of L. union skates are utilizing, exploiting the workers' hate for company unions, stirring and intensifying it, focusing their thoughts and feelings on the company-union evil, exaggerating the power of company unionism, in order to keep them blind to the faults and shortcomings of the A. F. of L. organizations." Detroit Digs In (1937)Article by Edward Levinson, The Nation, 1937. "General Motors must have known it was making an offer which the union could not consider without inviting a repetition of the collapse of the 1934 strike. While talking peace to Governor Murphy it has thrown up breastworks for a fight to the end." Fair Labor Standards Act of 1938Written by Jonathan Grossman. The Fair Labor Standards Act of 1938 applied to industries whose combined employment represented only about one-fifth of the labor force. In these industries, it banned oppressive child labor and set the minimum hourly wage at 25 cents, and the maximum workweek at 44 hours. Flint Faces Civil War: 1937Article by Charles R. Walker, The Nation, 1937. "'We'll stay in till they carry us out on stretchers,' is the message sent out by the sitdowners in Fisher 2. 'We'd rather die than give up.'" Flint Sit-Down Strike (1936-1937)The Flint Sit-Down Strike is known as the most important strike in American history because it changed the United Automobile Workers (UAW) from a collection of isolated individuals into a major union, ultimately leading to the unionization of the United States automobile industry. Harlan: Working under the GunArticle written by John Dos Passos, The New Republic (1931). "Harlan County in eastern Kentucky, which has been brought out into the spotlight this summer by the violence with which the local Coal Operators' Association has carried on this attack, is, as far as I can find out, a pretty good medium exhibit of the entire industry: living conditions are better than in Alabama and perhaps a little worse than in the Pittsburgh district." Haywood, William "Big Bill" DudleyWilliam D. "Big Bill" Haywood ranks as one of the foremost and perhaps most feared of America's labor radicals. Physically imposing with a thunderous voice and almost total disrespect for law, Haywood mobilized unionists, intimidated company bosses, and repeatedly found himself facing prosecution. Hill-Billies Come to Detroit (1934)Article by Louis Adamic, The Nation, 1934. "In recent months, with production increasing, it has been necessary for the companies to bring in tens of thousands of people from outside, principally from the South, and put them to work in the busy plants. For months now the companies have been sending their labor agents to recruit hill-billies from Kentucky, Tennessee, Louisiana, and Alabama." Hillman, Sidney - (1887-1946)Sidney Hillman, the founder of the Amalgamated Clothing Workers of America (now UNITE!) and its president from 1914 to 1946, invented trade unionism as we know it today. Jane Addams and the 1894 Pullman StrikeChapter 13 from the book: "Citizen: Jane Addams and the Struggle for Democracy" by Louise W. Knight. "The strike was a public crisis. Its eruption raised difficult questions for Addams about the ethics of the industrial relationship. What were George Pullman’s obligations to his employees? And what were his employees’ to him? ...Who had betrayed whom? Where did the moral responsibility lie?" Knights of LaborArticle by Michael Barga. The Noble and Holy Order of the Knights of Labor were the most prominent labor organization of the 1880’s. Characterized by its oath-bound secrecy, its emphasis on autonomy of local Knights and non-violence, and its broad sense of solidarity, it is considered by many to be a failed experiment in the labor movement which did not capitalize on the action-mindedness of the Great Upheaval moment. Labor History Timeline: 1607 - 1999From the earliest days of the American colonies, when apprentice laborers in Charleston, S.C., went on strike for better pay in the 1700s, to the first formal union of workers in 1829 who sought to reduce their time on the job to 60 hours a week, our nation’s working people have recognized that joining together is the most effective means of improving their lives on and off the job. Mason, Lucy Randolph (1882-1959)Lucy Randolph Mason devoted her life to bringing about more humane conditions for working people, ending racial injustice and ensuring that union organizers throughout the South were guaranteed the constitutional rights to free speech, assembly and due process that her ancestor, George Mason, had helped establish. National Labor Relations Board The National Labor Relations Board is proud of its history of enforcing the National Labor Relations Act. Starting in the Great Depression and continuing through World War II and the economic growth and challenges that followed, the NLRB has worked to guarantee the rights of employees to bargain collectively, if they choose to do so. Peterson, Esther (1906–1997)Esther Peterson was a trailblazer—as a woman and an advocate for workers’ rights. She was honored by the National Women’s Hall of Fame as “one of the nation’s most effective and beloved catalysts for change.” In 1981, Esther received a Presidential Medal of Freedom, our nation’s highest civilian award, to honor her more than 50 years of activism. Profile of General Motors (1937)Article written by Samuel Romer, The Nation, 1937. "When sitdown strikes in five General Motors automobile and parts plants resulted in a practical paralysis of production operations and forced direct negotiations between national officers of both the corporation and the union, few of the workers involved realized that they were participating in the first important battle of a civil war which will largely determine the industrial progress of America during the next decade." Rose Schneiderman: N.Y. Senators vs. Working WomenRose Schneiderman, an organizer for the New York Women’s Trade Union League, worked to bring together middle and working-class women in support of women’s right to vote. She makes a good case here against male politicians’ opposition to woman suffrage and she supports working women’s efforts to reduce the hours of labor and secure protective legislation. The Detroit Strike (1933)Article by Samuel Romer, The Nation, 1933. "...There were only about 450 men working in the plant then--but every one of them put away his tools and walked out. So began the first major labor struggle in Detroit since the period immediately following the war." United We Eat (1934)Article written by John S. Gambs, Survey Graphic, 1934. "In this fashion, carrying on their banners the device used by men in the Continental Navy—-the coiled rattlesnake and the militant words, Don't Tread on Me—thousands of men and women are protesting the inadequacies of unemployment relief." Washington Sweatshop (1937)by Robert S. Allen, The Nation July 17, 1937. 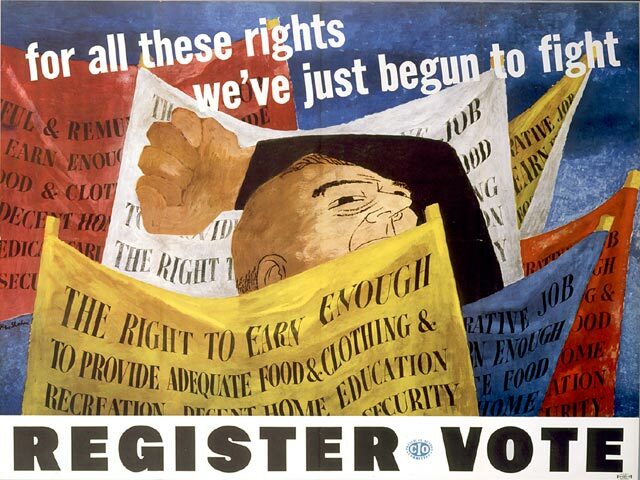 Wage-hour legislation was a campaign issue in the 1936 Presidential race. Why Ford Workers Strike (1933)Article written by Carl Mydans, The Nation, 1933. "The real object of the strike at the Edgewater, New Jersey, plant of the Ford Motor Car Company was, of course, a wage increase. The workers seized the opportunity, however, to protest against a number of the conditions under which they had been working." Women's BureauThe Women's Bureau was established in the Department of Labor by Public Law No. 259 of June 5, 1920. It is the only federal agency mandated to represent the needs of wage-earning women in the public policy process.